1. Start with the right template. If you’re creating an RSS-Driven Campaign in MailChimp, make sure you start by selecting RSS-Driven Campaign, and then choose one of the RSS template options. No matter what code you insert into a non-RSS template, MailChimp won’t be able to find your blog posts when your campaign sends. And even if you do choose an RSS template, it won’t display your blog posts if you haven’t chosen the right kind of campaign to begin with. Hint: If it doesn’t ask for your RSS feed address on the first step, you haven’t chosen the RSS-Driven Campaign–go back to go. 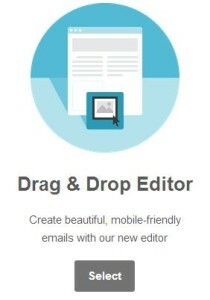 If you’re creating a newsletter, choose MailChimp’s Drag & Drop Editor before you ever get to your template selection. 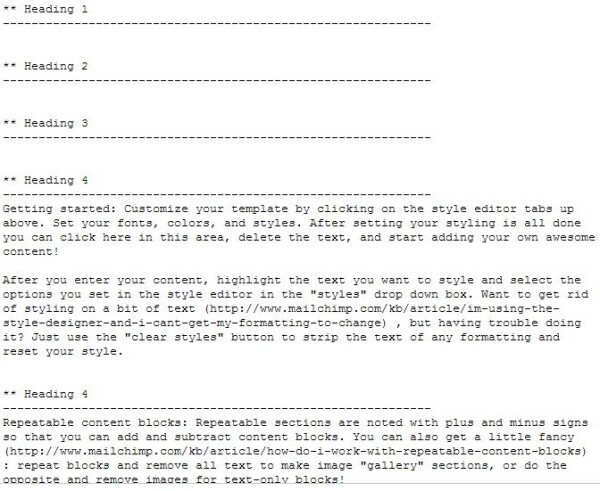 Drag and drop gives you so many more options for content blocks and layout! 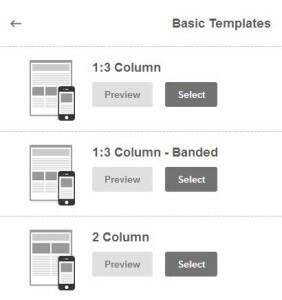 MailChimp still gives you the option to use 2, 3, and even 4 column templates. But I’ve started moving to the 1 column style because email programs and screen sizes vary so much! This isn’t a PDF newsletter that needs to fit on an 8 1/2 x 11 sheet of paper when it is printed out. What you’re creating is a fluid, re-sizable email that will be viewed in all kinds of browsers, email clients, and apps. If you go too wild with the columns, the email may appear imbalanced and off-center depending on where it’s viewed. Mad Mimi Tip: In Mad Mimi, your header image may appear off-center if the images in your blog posts are too wide. You can choose to “Automatically format RSS feed for clean display” but that only shows an excerpt of your post (an option I use for the weekly digest) rather than the full text (which I prefer for daily posts via email). Your subject is what determines whether your readers open the email or not. Make it good and catchy (but not spammy!). If you’re sending out your posts via RSS to email, the blog post title should be the subject line of your emails. (Click to Tweet this tip.) They can already see who the email is from–no need to repeat that. And if they already caught up on their feed reader for the day or saw your post on Twitter, showing them the post title in the subject tells them whether they’ve read it or not. If you want to distinguish your posts via email from your newsletters, follow the post title with a parenthetical note of something like “New Blog Post”. Tip: In MailChimp, use *|RSSITEM:TITLE|* for your subject line. In Mad Mimi, use (post_title) for your subject line. (And if you’re still using FeedBurner, you can customize your subject line, too.) Be sure to test your campaigns to make sure you have the right field in the right spot so you don’t end up sending out an email with a broken piece of code in the subject line. 4. Pay close attention to the first text your readers see. Many email programs (including Gmail) often display the first few words of an email before you even open it (check out email previews from all sorts of different email programs here). Hopefully the subject has already hooked them, but if not, this is your last chance to reel them in. 5. Create custom header graphics. 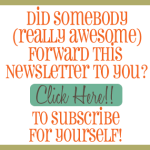 If you really want to give your emails some pizzazz, create custom header graphics for each newsletter campaign. One for your newsletter, one for your daily posts via email, and perhaps even another for your weekly digest. (Don’t forget a header for your signup forms, too–employ consistent branding everywhere!) They’re easy to put together in PicMonkey using your blog’s header or button–or talk to your designer about creating some for you when you get your blog redesigned. Graphics make an email really pop! 6. Link to your social media profiles. If people are opening and reading your emails, they are likely to want to engage with you via social media as well. Make sure they don’t have to search for you on Facebook once they finish reading your newsletter: they may get distracted and never get there. Include your social media buttons somewhere in every email. Mad Mimi does this automatically if you’ve filled out the Social Links in the Social tab. If you choose MailChimp’s Drag and Drop Editor, you can drag a Social Follow block into your email campaign. For an even more custom look, add a text block and insert the code for the social media buttons you use on your site. Be sure to link each image to the right social media platform! 7. Include a subscribe link for forwarded copies. Nothing’s worse than having a friend forward you an email newsletter that you really love and not being able to figure out how to subscribe to it. Unless someone uses the “forward to a friend” feature to share your email with their friends (and if we’re honest, none of us have ever used that feature–we just hit our email program’s forward button), there’s no subscribe option in the email unless you put it there. Add a P.S. or a catchy button that links to your subscription page (you do have a page on your site with your signup form and details about your list options, right?). 8. Make the fine print fun. Most of us skip right over fine print unless it’s actually creative. But especially if you have multiple list options, you don’t want your readers to miss the opportunity to update their subscription preferences–make the fine print fun to read and click on! You can’t change the footer in the free version of Mad Mimi, but in MailChimp you can have some real fun with the footer. Make sure to leave all the field codes in there so the right items get displayed for legal purposes. But change up the text that’s displayed there. Make it look different than all the other MailChimp generated emails they’re getting. Be sure to highlight the “Update Subscription Preferences” option if you have more than one group or subscription option. 9. Don’t neglect the plain-text version. The majority of your readers may have a smart phone, but not all of them do. And some of them–like me–still get our emails on on a “feature” phone which has only the most basic email program. Don’t neglect that final step of editing the plain-text in MailChimp. Not only is the plain-text version what people with older phones or computer software will see, but the preview that Gmail and other email programs offer is also pulling from the plain-text rather than the HTML version as well. 10. 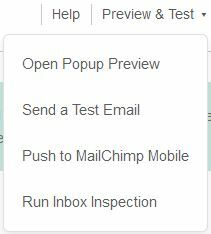 Preview your campaigns and send test emails. Preview your email campaigns in both HTML and plain-text. (The plain-text preview option is not available in Mad Mimi.) It just takes the click of a button and a few moments of your time to check your email for errors before it goes out. In MailChimp, click the “Header Info” button in HTML preview, or check “Show header stuff” in plain-text, to see what the subject line will actually be. Do you use any of these techniques in your email campaigns? 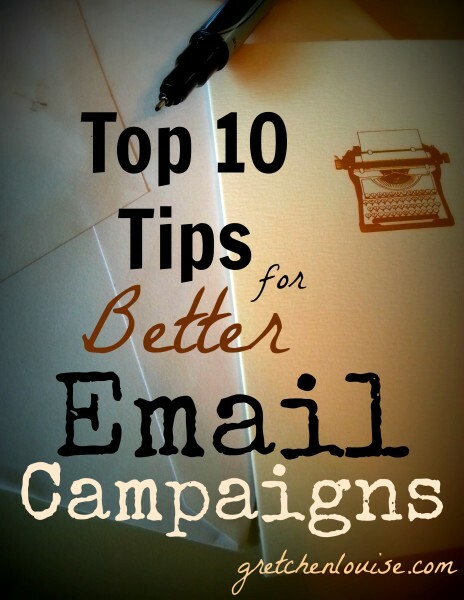 What is your top tip for better emails? Tell us in the comments! Forward me your creative campaigns at gretchen at gretchenlouise.com — I’d love to see what you’re doing! Your tips have been so helpful. I was wondering, when Mailchimp sends out a blog post via the RSS option, and a reader reads it via email but does not click and go directly to the post/blog, how does that affect Google Analytics? Would it be counted as a visit or session? Hello Chanel! Unfortunately, when an email is viewed but not clicked on, your site won’t show a visitor in Google Analytics or any other stat program. MailChimp does integrate with Google Analytics to track visits to signup forms, as well as to link clicks to specific email campaigns. But email reads/views won’t be counted in Google Analytics. I’m struggling for some time now with my RSS driven campaign in mailchimp. I use the merge tags *|RSSITEM:CONTENT_FULL|* to display my entire blogpost in the email but it only copies the first 6 lines of my post without any images 🙁 How can I fix this to display much more of my post + the images… Is the RSS campaign not the one to choose then? It looks to me like your feed settings are set to only show the summary rather than the full feed, which is why MailChimp can’t pick up the full feed. Check Settings, Reading in your WordPress dashboard. According to http://kb.mailchimp.com/merge-tags/rss-merge-tags#RSS-item-tags, *|RSSITEM:CONTENT|* is the summary, *|RSSITEM:CONTENT_FULL|* is the full post. Try choosing the completely custom drop-down, rather than just “excerpt”? A great post with really helpful suggestions – thank you. I can’t say how many times I’ve referred back to this…and this morning I’m crafting my first newsletter so I’m back again. 🙂 Thanks yet again for this wonderful resource, Gretchen! Yes, you would just copy the HTML code out of your text widget and place it in the code of a “Text” block in MailChimp. Just be sure to click the <> button when you’re editing the text block so that you are editing the code not the regular text. Does that work?